Calgary, Alberta has a rich history, and there's a lot to see when wandering around the downtown core. From new skyscrapers to modified historic buildings, there are a lot of clues that tell a story about the city's evolution and growth. I'm fascinated by urban landscapes, and as a professional photographer I've enjoyed showcasing them through the art of "ghosting". Ghosting is the process of taking an archival image, photographing the same location as it looks today, and then blending the two compositions together to showcase both the past and present in a single shot. I first attempted "ghosting" in my hometown of Medicine Hat, Alberta and came away with some really intriguing results. Applying this technique to downtown Calgary, Alberta meant that the juxtapositions would be even greater. Here are some of the results. 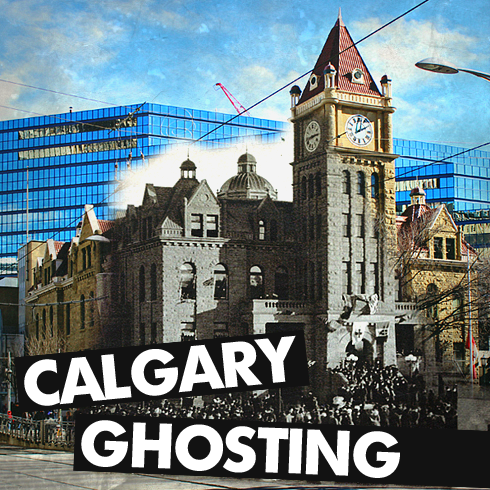 Explore part 2 of the Calgary ghosting series here. Calgary Fire Hall No. 1 - 1915 merged with 2016. 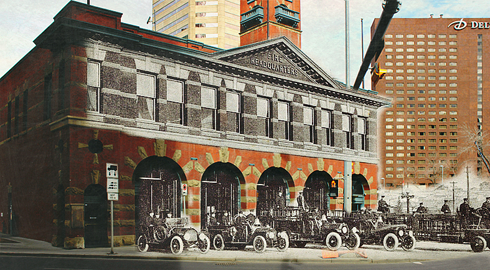 In this image you can see the old fire engines lined up outside of the fire hall. 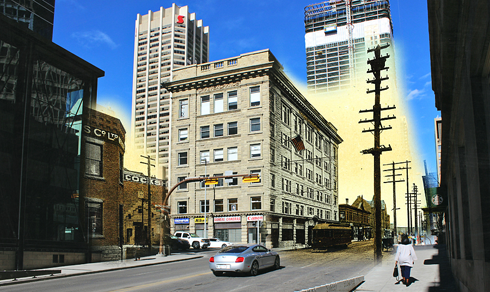 The exterior of the building is nearly identical to how it looked a century ago, although the skyscrapers in the back demonstrate how Calgary outgrew the station. Today the building houses a car rental company. Hudson's Bay Department Store - 1920s merged with 2016. 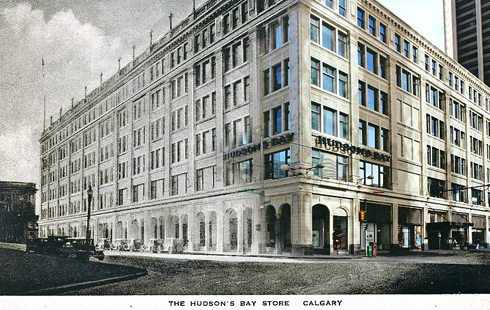 Still an impressive building in the heart of downtown, the Hudson's Bay store is still very recognizable. It's the traffic and towers that surround it that have changed dramatically. Central United Church - 1930 merged with 2016. I love that the Calgary Tower is visible in this ghosting image. 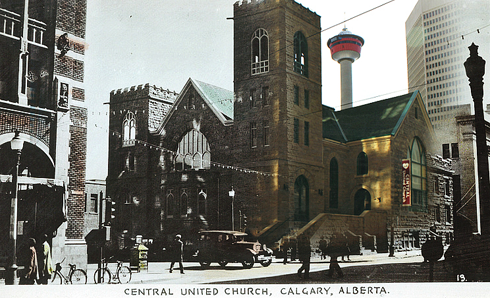 The Central United Church still looks the same, however an LRT line now runs in front of it and the building across the street has been replaced with a modern office tower. Palliser Hotel - 1912 merged with 2016. 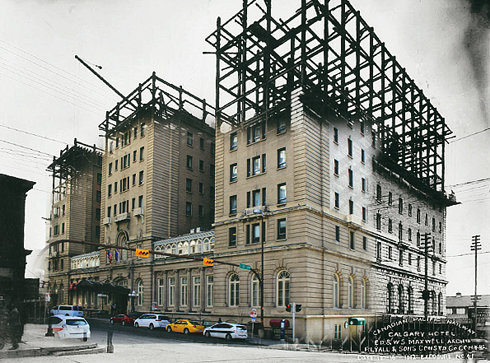 Here you can see the exposed girders of the hotel blended with the facade as it looks today. It can't be understated what a big construction project this hotel was for Calgary at the time. Canadian Pacific Railway was constructing the Palliser as a hospitality stop for the influx of tourists heading west to their Banff Springs Hotel. 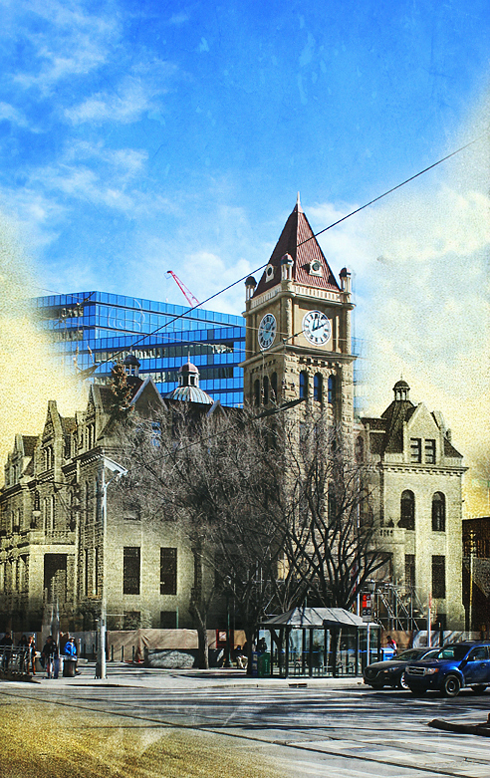 City Hall - 1920s merged with 2016. Contrasting the old and new city halls. Grain Exchange Building - 1912 merged with 2016. The growth of downtown Calgary is further emphasized by the construction of Brookfield Place in contrast to the Grain Exchange - one of the first office towers in Alberta. 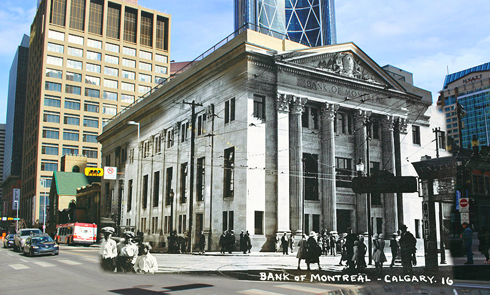 Bank of Montreal - 1910s merged with 2016. The surrounding office towers, especially The Bow in the background, are prime examples of Calgary's growth around this once large downtown bank. 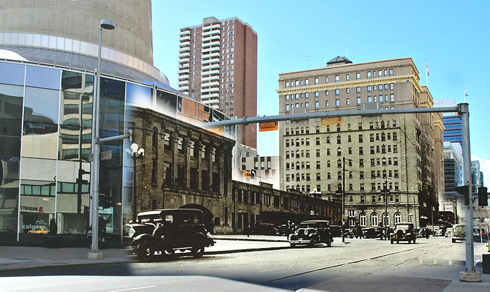 Train Station & Palliser Hotel - 1930s merged with 2016. The historic Canadian Pacific train station has since been demolished, however a new icon now stands in its place. The glass base of the Calgary Tower now dominates the former plaza / parking lot that used to be in front of the station. 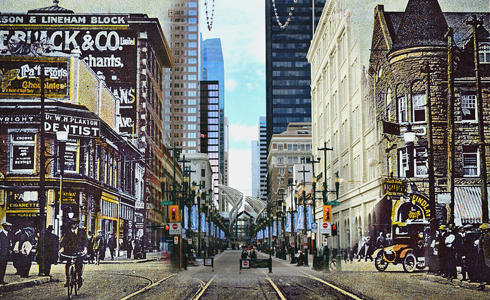 Stephen Avenue - 1910s merged with 2016. The painted ads, streetcar tracks and traffic have now been replaced with pedestrians on today's Stephen Avenue. 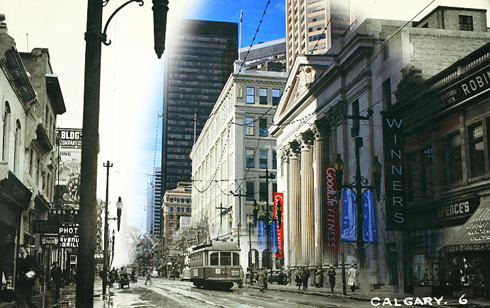 Stephen Avenue - 1920s merged with 2016. One more from this amazing street.